Perennial. Cooked like spinach it makes delicious soups and purees. 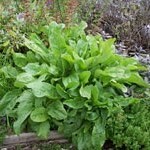 Can also be eaten raw in salads. Likes moisture. Sow spring to early summer. Perennial. 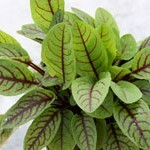 Bright green leaves contrast with red stems and veins. Sharp and tangy. Sow spring to early summer.